On the range before his final round of the 2019 Masters, golf fans noticed Francesco Molinari doing what seemed to be a rather strange drill. The Italian would take his setup and make his backswing, then squat low into the ground, and then jump — literally, jump — off the ground so he’s airborne for a moment as he swings through. So, what’s the point of this drill? And should you try it yourself? First, you need to understand a phrase called “Ground Reaction Forces,” a phrase that is increasingly common in the golf world and is taught by many renowned instructors, like GOLF Magazine Hall of Fame Teacher Mike Adams. Here’s how it works: When you hit a golf ball, your body is only connected to two things, your club (through your hands) and the ground (through your feet). The ground can be a big source of power in your golf swing — if you use it correctly — because it can give you a leverage point. The same way you push off against the wall in a swimming pool to help you dive faster, the same forces are at work in the golf swing. Coiling and pushing into the ground, and then jumping off it is called “vertical force,” and it’s something that can help you whip the club through the ball along the way. And that’s exactly what Francesco Molinari is working on here. 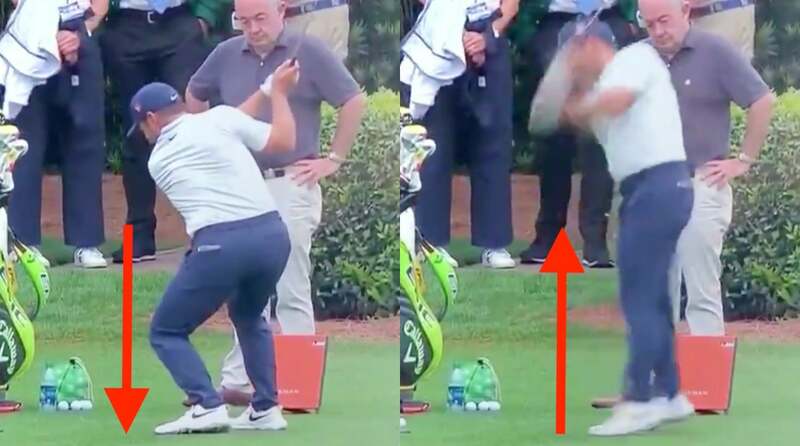 In the left frame, you can see Molinari squatting down, applying force into the ground. In the right frame, he releases all that torque. He jumps up, which helps him whip the club through. Using the ground more effectively, as Francesco Molinari is practicing here, is a big reason the Italian has gained so much power in recent years, which has propelled him to one of the best players in the game.